KARACHI: Zaid Hamid’s nefarious plans to assassinate Pakistani Army Chief General Ashfaq Pervez Kayani have been exposed by Hamid’s own former staff officer, Geo News reported. The former staff officer and media coordinator of Zaid Hamid, Emaad Khalid said on Wednesday that Hamid used to send text messages, emails and policy papers to 1,000 army officers claiming that General Kayani had sold out and was working for the Americans. He added that Zaid Hamid was instigating junior officers of the army to stage a coup against General Kayani and the federal government. The former staff officer revealed, that Hamid was a supporter and advisor of former military dictator Pervez Musharraf, a fact that Zaid Hamid acknowledged. “Zaid Hamid wanted an army chief like Musharraf who destroyed the image of Pakistan.” Khalid further said that General Kayani had restored the image of the Pakistan Army. Khalid said that Zaid Hamid benefited from anarchy and chaos in Pakistan and was a supporter of sectarian violence in the country. Senior Journalist and Geo News anchor, Hamid Mir said the government was aware of Zaid Hamid’s conspiracies but no action had been taken against him. 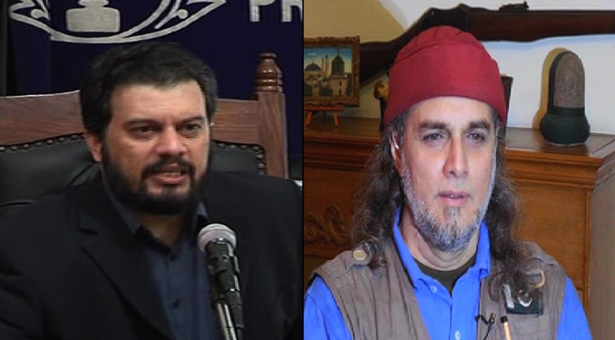 Chairman of the Pakistan Ulema Council, Tahir Ashrafi called Zaid Hamid an enemy of Islam and Pakistan. Ashrafi called on the judiciary and government to take immediate notice of conspiracies being hatched by Zaid Hamid. This entry was posted in Exposition, News, Press Conference and tagged Emaad Khalid, Pakistan Army, Press Conference, yusuf kazzab, zaid hamid.